Considered to be one of the greatest players the game has ever seen, Valeri Kharlamov of the Soviet Union was born on this date in 1948. He joined the Central Red Army club in the Soviet Elite League in 1967-68 and scored two goals in 15 games as a rookie. 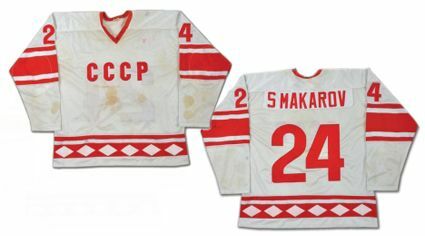 Having got his feet wet the season before, Kharlamov made no secret of his prodigious talent the following season when he increased his goal scoring to 37 goals in 42 games of the shorter Soviet League season. Following the season he would make the first of his 11 consecutive World Championship appearances and contributed 13 points in ten games on his way to the first gold medal of his illustrious international career. 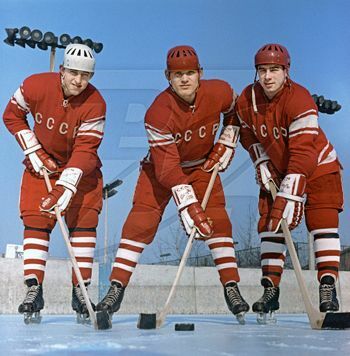 In the 1969-70 season Kharlamov averaged a goal per game while playing in 33 contests for Central Red Army in a season which concluded with the first of four consecutive Soviet League championships. He followed that with ten points in nine games on his way to another World Championship gold medal. 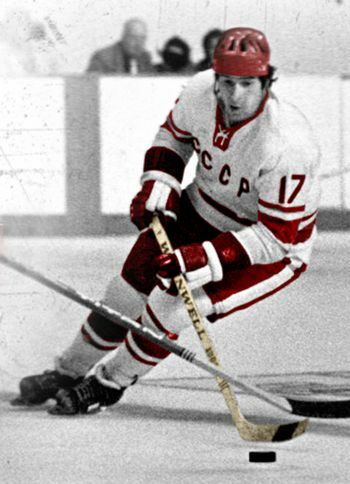 Kharlamov won the Soviet League goal scoring title in 1970-71 with a career highs with 40 goals and 52 points in 34 games. He earned his first World Championship All-Star selection when he tallied 17 points in ten games as he was awarded his third consecutive World Championship gold medal, the dominant Soviet Union's 9th in a row. He one-upped himself by capturing the Soviet League points scoring title in 1971-72, albeit with a lower personal point total that the previous season, with 40 points and was named the Soviet League MVP for the first time. That was not the highlight of Kharlamov's season however, as he introduced himself to the world as he led the Soviet Union to the gold medal at the 1972 Olympic Games in Sapporo, Japan where his 15 points in just five games led all scorers by six points as the world got their first real glimpse of his superior skating and playmaking abilities. 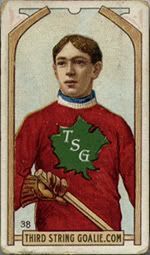 Later that spring he was again named to the World Championship All-Star team, but had to settle for the silver medal for the first time. 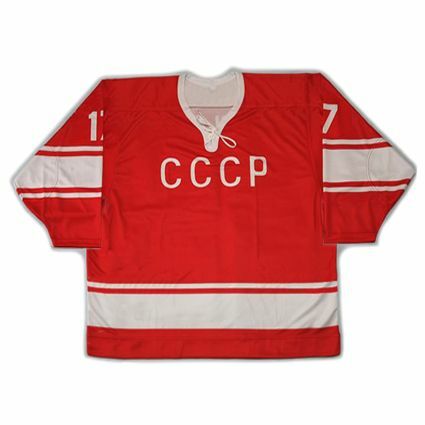 In case anyone missed his performance in the Olympics, Kharlamov became a true star of international hockey with his performance in the fabled 1972 Summit Series when the best that the Soviet Union had to offer took on an All-Star team of Canadian professionals for the first time ever. While many in Canada assumed that their professional players would easily win all eight games of the series, Kharlamov led the Soviets with two goals in their stunning Game 1 upset of Team Canada on home ice in Montreal. While Canada led by two six minutes in, the Soviets quickly turned the tide, evening the score before the period ended and began to pull away with Kharlamov's two goals in the second on their way to a 7-3 win. After losing Game 2, Kharlamov contributed another goal in their 4-4 tie in Game 3. After the Soviets 5-3 win in Game 4 in Canada, the series shifted to Moscow in the Soviet Union. When the Soviets came from behind 4-1 to win Game 5, Bobby Clarke of Canada deliberately broke Kharlamov's ankle in Game 6 which enabled the Canadians to stage a comeback and eventually win the series in a dramatic Game 8. A fourth Soviet League title came in 1972-73 as he scored 32 points in 27 games after recovering from his broken ankle. A return to World Championship gold was powered by an on-from Kharlamov as he racked up 23 points in ten games for the host Soviet Union. The consecutive championship streak ended in the Soviet League in 1973-74 but the World Championship success continued with another gold in 1974. Prior to the start of the next season, Kharlamov again participated for the Soviet Union in the 1974 Summit Series, where they took on a team of mainly Canadian professionals from the World Hockey Association, which the Soviets won with a 4-1-3 record. Kharlamov contributed seven points in the eight games. The Soviet League title returned to Central Red Army in 1974-75 as Kharlamov had a great season with 39 points in 31 games and yet another World Championship gold on the heels of 16 points in 9 games. 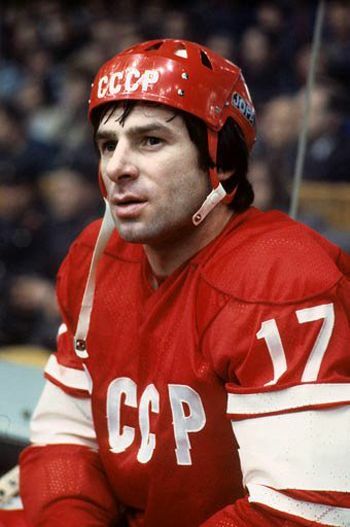 While his personal scoring level continued unchanged in 1975-76, Kharlamov had to unusually settle for silver in both the Soviet League and the World Championships. 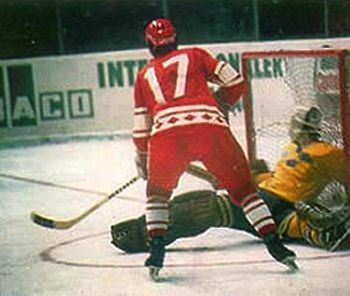 All was not lost however, as the Soviet Union dominated the 1976 Olympic Games in Innsbruck, Austria to win the second gold medal of Kharlamov's career. 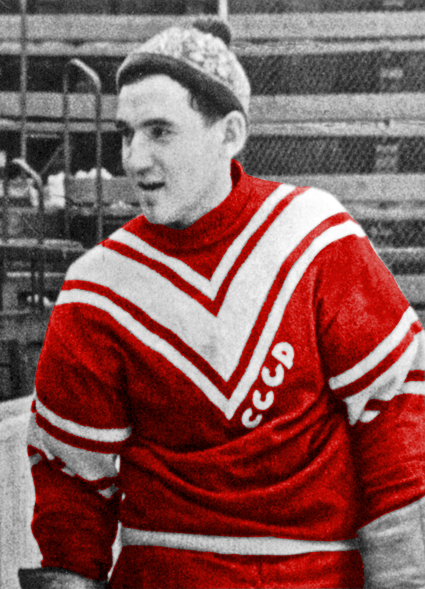 He would be one of four Soviet players to tie for the tournament scoring lead with ten points in five games, including his game winning goal in their final game against Czechoslovakia. 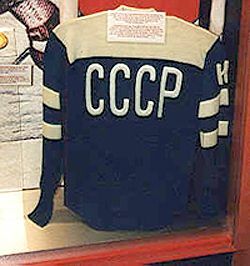 Of interest, it was during the Soviet League season that the Central Red Army club took a break from domestic competition and participated in the first Super Series of exhibition games in North America against teams from the NHL which included a win over the New York Rangers, the enthralling tie against Montreal on New Year's Eve, called by many the greatest game of hockey ever played, another win, this time over the Boston Bruins and the notorious game against the Philadelphia Flyers when Kharlamov was targeted with an elbow to the head from the blind side which caused the Soviet coach to pull his team off the ice when to penalty was called. That spring he was seriously injured in a car accident, which put his hockey career in jeopardy and cost him a chance to compete in the 1976 Canada Cup. While Kharlamov was limited to 21 games because of recovery time from his injuries, the 1976-77 saw Central Red Army begin an era of dominance unlike any ever seen before with the first of 13 consecutive titles but the national team would fall to third place and the bronze medal at the World Championships. Kharlamov would have one of his best offensive seasons when he totaled 42 points in only 29 games during the 1977-78 domestic season and a new run of gold medals would begin at the 1978 World Championships, the first of five in a row for the Soviet Union. He was in peak form in 1978-79, scoring 22 goals and 48 points in the Soviet League, his greatest number of points since 1971. He had another impressive tournament at the World Championships with 14 points in eight games as the Soviet Union won gold on home ice in Moscow. 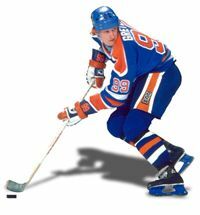 He also participated in the 1979 Challenge Cup for the Soviet Union in a three game series against a team of NHL All-Stars which took the place of the normal NHL All-Star Game that season, which the Soviets won two games to one with a decisive 6-0 victory on Game 3. 1979-80 was a memorable campaign for Kharlamov as he added 38 points in 42 games and another Soviet League title. In February of 1980, his chance at his third consecutive Olympic gold medal was derailed by the "Miracle on Ice" during which the Soviet Union was upset by the United States in an upset so great that the loss was ranked the #1 story of the century by the International Ice Hockey Federation (IIHF). 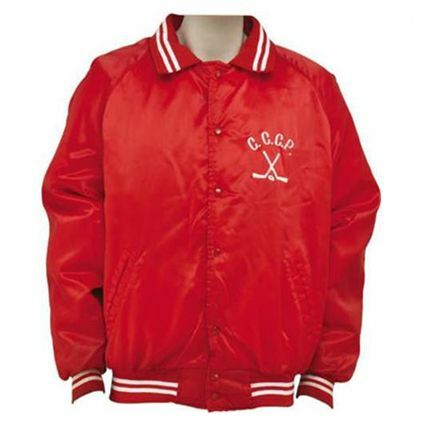 The Soviet Union eventually was awarded the silver medal with a 7-1 record. Of note, there were no World Championships held in 1980 due to the Olympic games. A final Soviet League title for Kharlamov came in 1980-81 when he scored 25 points in 30 games. During his Soviet League career, Kharlamov scored 293 goals and 214 assists for 504 points in 436 games. Sadly, on August 17, 1981, Kharlamov was killed at the age of 33 due to injuries suffered in a car accident which also claimed the life of his wife Irina. In 1998, Kharlamov was inducted into the IIHF Hall of Fame. 2005 saw him become only the second non-NHL player to be inducted into the Hockey Hall of Fame, joining fellow Soviet player and teammate, goaltender Vladislav Tretiak. In 2008 he was selected as just one of six players to be named to the IIHF Centennial All-Star Team, honoring the best players in the 100 year history of the IIHF. The IIHF Centennial All-Star Team announcement honoring Kharlamov, Tretiak, Slava Fetisov, Borje Salming, Wayne Gretzky and Sergei Makarov. Other tributes to Kharlamov include a division of the top Russian professional hockey league, the KHL, being named after him, the the award for the top Russian player in the NHL each season being named the Kharlamov Trophy and the championship team in the junior league in Russia for players aged 17-21, the Minor Hockey League, is awarded the Kharlamov Cup. 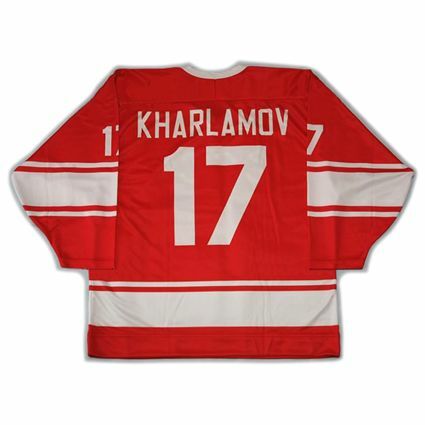 Additionally, Kharlamov's #17 has been retired by both the Central Red Army club and the Russia National Team. In total, Kharlamov won 11 Soviet League titles, eight World Championship Gold medals and two Olympic gold medals as well as one Soviet League scoring title, seven Soviet League All-Star awards and two Soviet League MVP awards and is the all-time leading scorer in the Olympics for the Soviet Union with 35 points in 17 games. 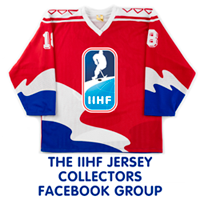 Today's featured jersey is a 1972 Soviet Union National Team Valeri Kharlamov jersey as worn in the 1972 Summit Series between the Soviet Union and Team Canada in which Kharlamov suffered a broken ankle after a deliberate slash in an effort to neutralize him. 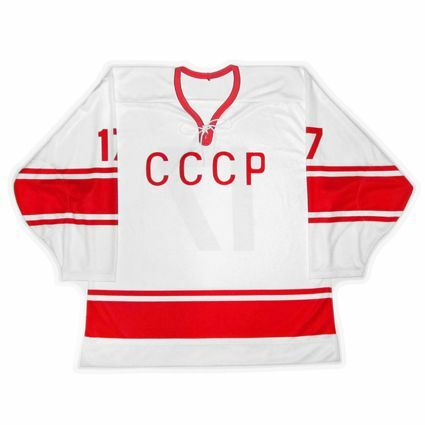 Soviet National Team jerseys were generally quite spartan in appearance, using simple red jerseys with generally minimal striping and one color white names and numbers. There were occasional dashes of flair, such as 1956's chevron striping, their first use of red and white after debuting in blue and white(!) 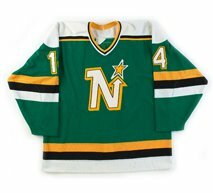 in 1954, 1987's dual triangle look and the diamond trim used on their jerseys in the late 70's and early 80's, such as those worn during the "Miracle on Ice". Just the addition of yellow trim in the late 1980's was a radical departure after 30 years of only red and white sweaters. 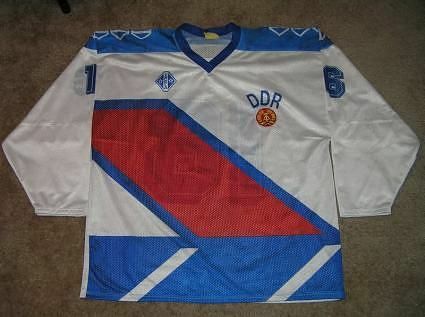 Bonus jersey: Today's bonus jersey is a 1976 Soviet Union National Team Valeri Kharlamov jersey. 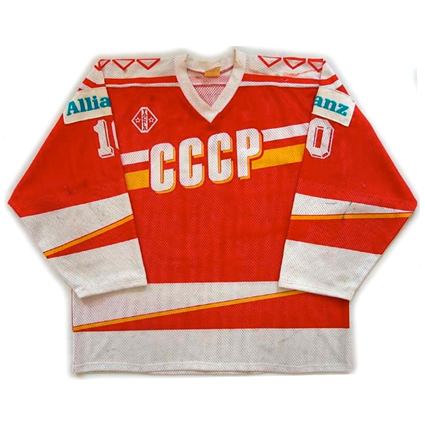 This simple jersey style severed the Soviets well for over a decade, having used it as far back as the 1964 Olympics, wearing it through the 1976 World Championships. 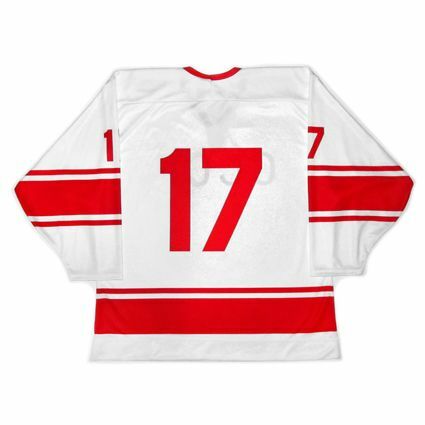 By 1976 the numbers used on the back were quite bold and much more professionally executed than the thin, seemingly hand cut numbers in the quirky font used in the 1972 Summit Series. 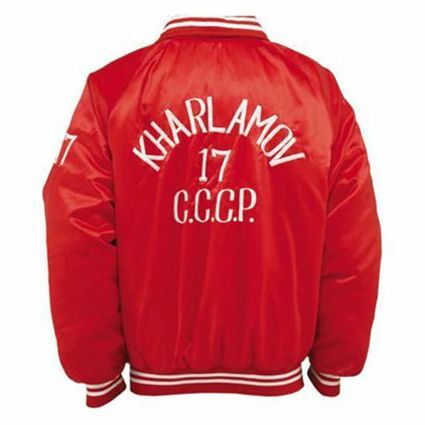 Bonus jacket: Today's bonus jacket is a 1970's Soviet National Team Valeri Kharlamov jacket as worn during the 1970's. Unusually, Kharlamov's name appears above the CCCP, which seems odd considering the entire philosophy of the team above the individual of the Soviet hockey system. 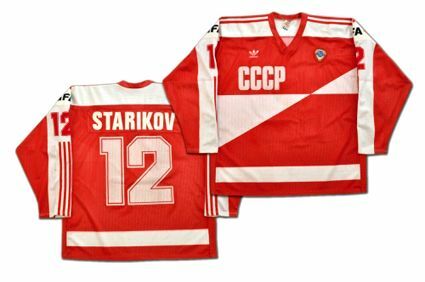 Still, the arched name over his number 17 and the CCCP makes for a striking look for this great piece of seldom seen team gear. Today's video segment begins with this tribute to Kharlamov. This next video is about the dedication of a monument to Kharlamov in Moscow and includes several interviews with former teammates who speak about their recollections of playing with him. Here is one more very well put together tribute video to Kharlamov, followed by his induction into the Hockey Hall of Fame in 2005.